I finished my first Sencha, a wearable muslin, yesterday; and I LOVE the pattern! Here’s how it all came out. 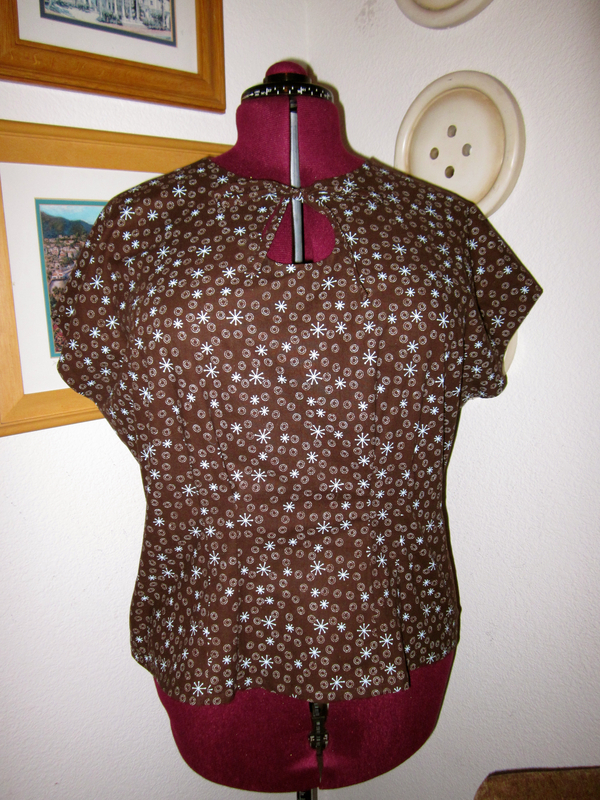 My wearable Sencha, from Colette Patterns. Don't you love the 1940s-inspired tie front? That was the whole allure of this pattern. Like the bangles? Charlotte at Tuppence Ha'penny was my inspiration. I've been buying them like crazy. According to Colette Patterns, their patterns are made for a C-cup; and you should use your actual bust measurement, not your high bust, when deciding what size to sew. i generally have to make a full bust adjustment for my D-cup and lower the bust point two inches, but this pattern seemed generous in all the right places. I selected a size based on my measurements and took a chance on a wearable muslin without making any pattern adjustments. Yay! I indeed got a wearable garment, and learned some reasons a wearable muslin is preferable to a regular muslin. The retro flair is what sold me on this fabric. The design looks white but is light blue. But first, let’s talk about how the pattern worked. The whole garment is an inch shorter than I would prefer. The darts, while releasing below my bust, should really release closer to my waist. There was plenty of circumference for my bust, but the front hem is riding up a good inch compared with the back hem. So that’s where a full bust adjustment would have helped. The first two points I could have realized upon closer examination of the pattern prior to cutting the material. But this was an experiment in “reading” a pattern, and now I know some key points to examine with regard to fit. So, when I make this pattern again, and I plan to at least two more times, I will lengthen the entire blouse by an inch, and lengthen the front piece by another inch, taking the extra out at the side with a dart. See how it rides up in the front? But I like the fit at the neckline, shoulder and waist, so I'll stick with this size, and just lengthen the front an inch and put in a dart. As I noted in an earlier post, there is a curious lack of interfacing for the center back, where the button closure is. The pattern calls for interfacing for the neckline only. Hmmm. Don’t know why that would be. It was easy enough to rectify. I cut interfacing to the fold line for each self-facing for the back closure. Blue buttons to match the blue motifs. (I know. They look white.) Can I just say I LOVE the buttonholes the Fancy Damn Sewing Machine makes? Perfect every time! Also, the back opening self-facing could have been cut on one with the back neck facing. It would have been a little more tidy that way, but would probably have been less efficient with material and layouts for the various sizes, all of which are on the pattern. I may change that next time around. The various sizes were a little difficult to follow where all the lines converged, particularly around the keyhole opening, but that didn’t seem to affect the outcome. Also, I know some people like the digest-size “book” setup of the Colette Patterns instructions, with the pocket in the back for the pattern and the front flap that closes it all, but it doesn’t work well for my particular sewing setup. I discovered years ago that if I gave up facing a window while I sew, in exchange for facing a wall with a giant 4 feet wide by 3 feet tall bulletin board, I would have a handy place for the pattern instructions. I much prefer the big instruction sheets tacked up in front of me. By making a “muslin” all the way through to completion, I ended up testing more than just fit. Turns out I also tested the construction techniques. I found a couple of challenges, and one technique worked surprisingly well. Turning the little ties was challenging. My blunt chopstick pushed right through the end of the second one, so I had to tuck the end in and hand sew it closed. This was cotton. Can you imaging trying it in silk? I’ll construct the ties differently with silk. 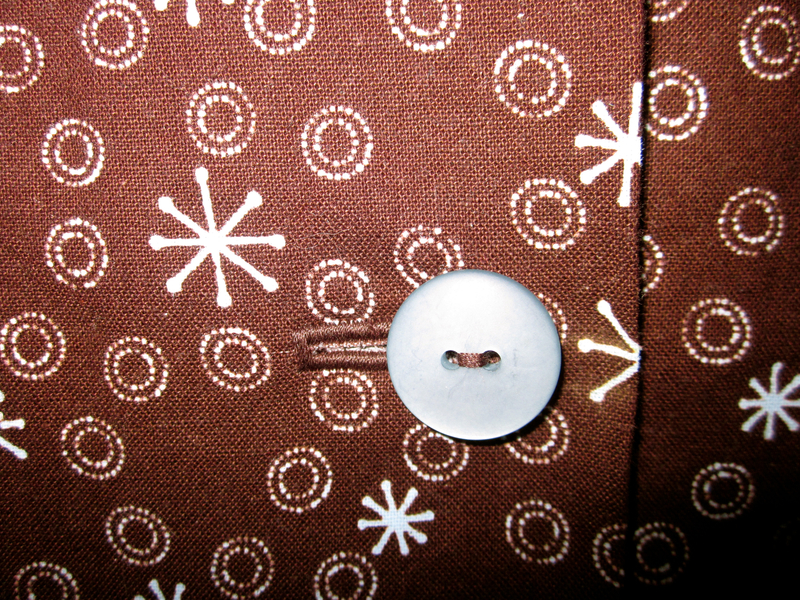 The round keyhole, the reason I chose the pattern to begin with, is a pretty tight circle. I did a credible job, but next time I’ll draw that seamline just to be safe! The “invisible” catch stitching on the sleeve hem and the back facings was a lot less visible than I thought! I won’t hesitate to do this on silk. I think it will work fine. I don’t think I need to underline silk to make it up in this pattern. I was really happy that my wearable muslin turned into a dry run on the entire garment construction. Now I can move on to a more expensive fabric with confidence. What an unexpected bonus from using inexpensive material and sewing to completion rather than using muslin and just checking fit. No wasted material. Plus, I got something to wear! Now for that “muslin” part. I got all excited about doing the wearable muslin in a quilting cotton and learning so much before sewing the pattern in a finer fabric, that I went out and bought more quilting cotton for a top and skirt I want to make. Only the cotton was $7 a yard on sale. Not quite so muslin-y is it? If I goof up, I’m still going to waste some decent, though not super-nice, fabric. But I think my skills are getting better. And I’ll spend more time tissue fitting the Swedish tracing paper to make sure it all works before I cut. If a pattern works for me, I like to make more than one. I guess I should always make the first version in an inexpensive material, to see if the pattern is worthy of moving on to something really nice. Hopefully, there will be more hits than misses in my sewing adventures. I learn so much with every project. Even the Sencha, which is suitable for beginners, had a lot to teach this 30-year sewing veteran! How nice this turned out! I usually do a wearable muslin unless I am working on a new technique or one I had not done for a long time. Like padded buttonholes, or a complicated pleating treatment. Beautiful on you as well. The skirt is perfect with this blouse. Happy New Year! Happy New Year to you as well, Corinne! I llike your thinking on the wearable muslin. 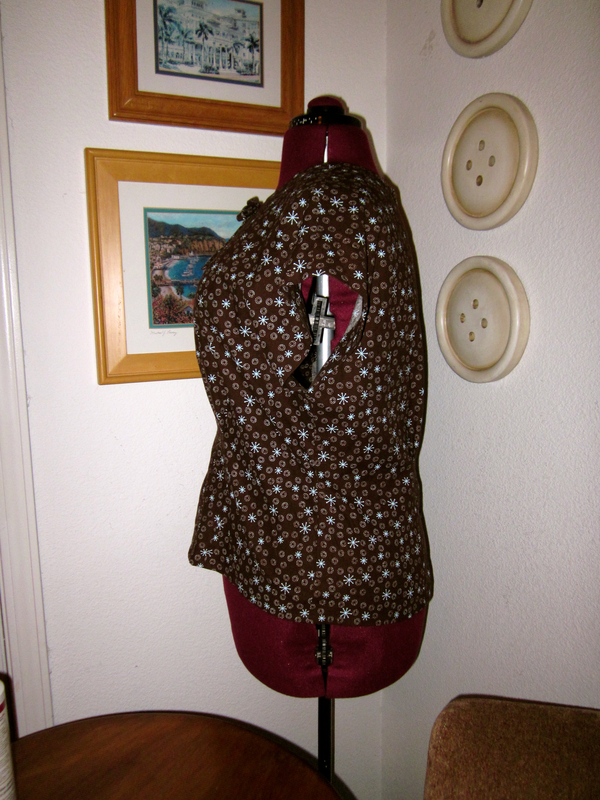 With more experience with fitting patterns, I think I’ll have more success with muslins.